After reading the graphic novel – The Beatles Story a couple weeks ago, I decided to search on Amazon to see if there were any other graphic novels about the Beatles. I’d love to find one that really WOW’d me and that I think would really impress other Beatles fans and collectors. The Beatles: All Our Yesterdays, written by Jason Quinn and illustrated by Lalit Kumar Sharma is one of two graphic novels I purchased. This book, published in 2016 by Campfire Books (a division of Kalyani Navyug Media in India), is 149 pages and is in full color. The publishers were even kind enough to include an adorable guitar shaped book mark in the back of the book which I chose to leave intact. Unfortunately, the good impression stops there. Despites it’s beauty, vibrant colors and bonus bookmark, this book is filled with falsehoods and just sloppy storytelling. The author starts his story at the very beginning with the birth of each of the Beatles and ends with the release of their first single. I was impressed to see it even mentioned temporary fill-in bass player Chaz Newby! There is also a short epilogue to bring the reader up to date. The typos are non-existent and the text itself is beautifully written (meaning it’s easy to read), but so much of the Beatles history is just blatantly wrong. I guess my search will continue for the ultimate Beatles graphic novel. I have another one on standby that I will review next week. I rate this book, 1 out of 4 Beetles! The Beatles Story is a 56 page black & white graphic novel written by Angus Allan and illustrated by Arthur Ranson due to be released on February 20, 2018. I was lucky enough to get at advanced copy from Rebellion Publishing and it is available for pre-order at Amazon.com. Despite what it says on Amazon, the dimensions of this book are 8.5″ x 11″. The beautiful cover is white with black matte text and illustrations except for the title and the Beatles hair which is done is high gloss black. This book starts at the very beginning with the story of all the young Fabs and includes their birthdays…except Paul McCartney’s. How this could have gone unnoticed, beats me. I admit I wasn’t too pleased with this book as I continued to read it. There were even more errors, starting with the now debunked claim that John Lennon was born during an air-raid and Mimi ran through the streets of Liverpool at night dodging bombs to see him in the hospital. The author also gives Stu Sutcliff a bigger part in Beatles history than he actually had. 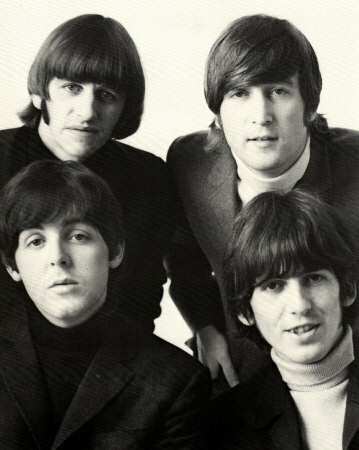 On and on the pages go until the John, Paul, George and Ringo decide to call it quits as a band. Well, Amazon got me again! While browsing online at Amazon.com, this book appeared as a Recommendations…. Lennon: The New York Years was written by David Foenkinos and Eric Corbeyran, illustrated by Horne and published on May 30, 2017. According to an article on NME.com, this graphic novel is adapted from a 2010 novel “Lennon” by French author David Foenkinos. After reading this book, there is a part of me that wants to see what the original was like. Continuing on my theme – The Fifth Beatle: The Brian Epstein Story, this week I decided to actually get around to reading the book! Written by Vivek J. Tiwary with artwork by Andrew C. Robinson and Kyle Baker, The Fifth Beatle is a graphic novel about the rise and fall of Beatles’ manager Brian Epstein. I purchased my copy at Vivek’s lecture last week at Monmouth University. He only had collector’s editions (which includes “a unique, textured cover and a section of bonus materials including unique Beatles and Brian Epstein memorabilia, artist sketches, and alternate covers”), so this review is based on this edition. This book is beautiful. From the cover to the artwork, it’s a wonderful addition to my collection…even though I’m not a Beatles collector. But, putting appearances aside…the writing seems to be lacking. The dialog and story seem to be very. halting. and. static. It lacks a certain flow. I want to say it would have been better written with more detail and spread out as a series of books then to cram the entire story into one 139 page book, making it all a bit confusing to those that really don’t know Brian Epstein’s tragic story. If you’d like to meet Vivek and get a signed copy of his book, he will be at the Fest for Beatles Fans in Rye, NY in April 2016. Last Monday (February 8th), I had the pleasure of driving 2 hours in the snow to Monmouth University in West Long Branch, NJ for the Jewish Cultural Studies Program called The Fifth Beatle: The Untold Story of the Jew Who Made the Beatles. The lecture was given by Vivek J. Tiwary – a Tony Award-winning Broadway producer, and the founder of Tiwary Entertainment Group. He also just happens to be the author of the graphic novel and #1 New York Times bestseller – The Fifth Beatle: The Brian Epstein Story. I’ve attended events in the past where Vivek was appearing with his book, but I’ve never had the opportunity to actually meet or hear him speak. Well, it turns out Mr. Tiwary can speak very well…and A LOT! (I don’t know that I’ve ever experienced hearing someone who can digress so far from his original thought and still remember to bring it back around.) His lecture on Brian Epstein was remarkably informative from the angle of Brian being not only gay, but Jewish in 1960’s Liverpool, England. He explained such issues as how Brian worked around his ethnicity by joining forces with other Jews in the music industry at the time, such as Sid Bernstein, when the two connected to bring the Beatles to America. I give this lecture/Vivek, 4 out of 4 Beatles! Note: Vivek’s book, The Fifth Beatle: The Brian Epstein Story is being made into a film or possibly a mini series for TV. Which format would you rather see this film made?